Surviving Toxic Mold | Mold Exposure | Mold Illness | Mold Testing | Mold Prevention - Where can I find mold in my home? | Where does mold grow? 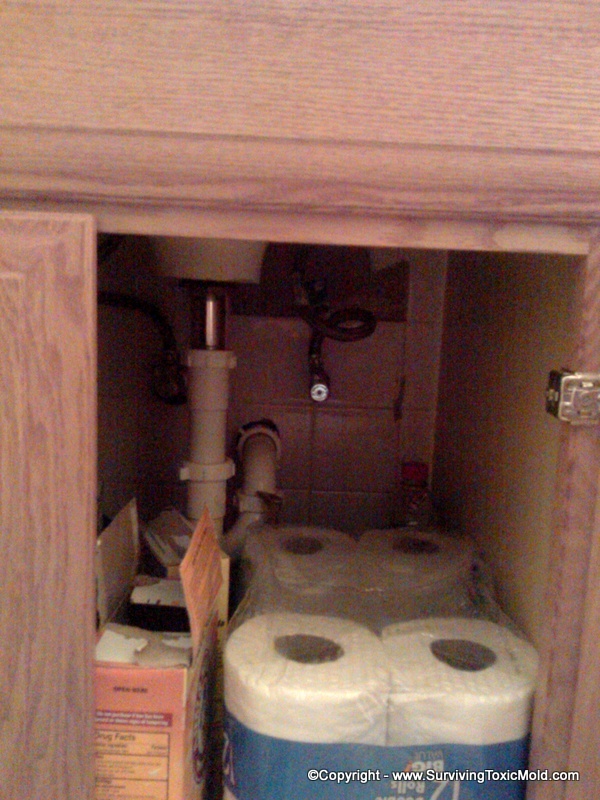 Under Sinks Under a sink is the most common place that toxic mold starts. Check pipes coming in from the main water line as well as seals around pipes. 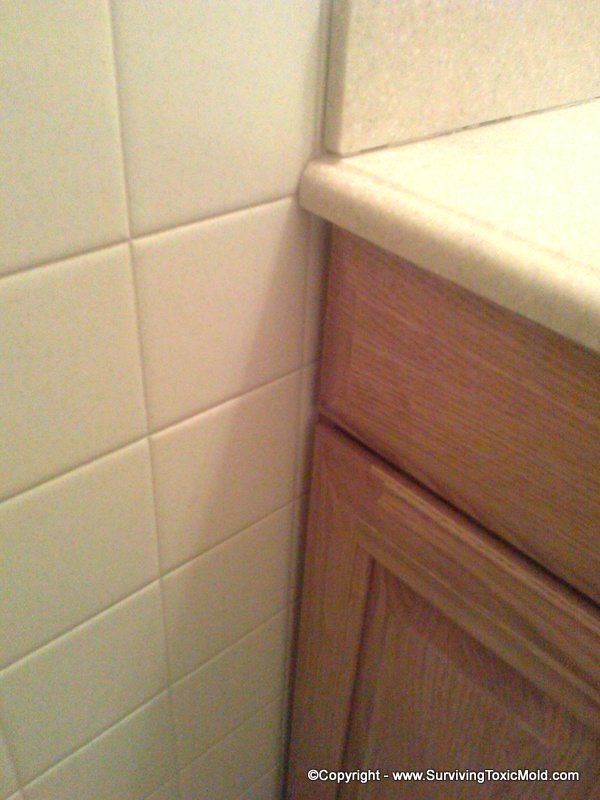 Between Sinks and Walls Toxic mold can lurk between sinks and walls. Bathrooms are very high moisture areas and if this area between the sink and wall is not sealed off...it can be a breeding ground for mold growth. *This is dangerous. You many not notice this until you remove the sink or you GET SICK. Check, clean up and seal to prevent any future issues. Between Sinks and Showers/Tubs This is probably one of the more obvious places you will see toxic mold growing. Each day as family members take showers the moisture can splash onto the side of cabinetry. Sometimes we do not have a choice as to the quality of cabinetry used, but if you are able to and own your own home, please think about spending a little more money on quality REAL wood cabinetry and apply extra coatings of varnish to the sides of the cabinets to prevent moisture from penetrating the porous part of the wood. Using substandard and paper/particle board cabinetry puts you annd your family at higher risk of toxic mold growth. 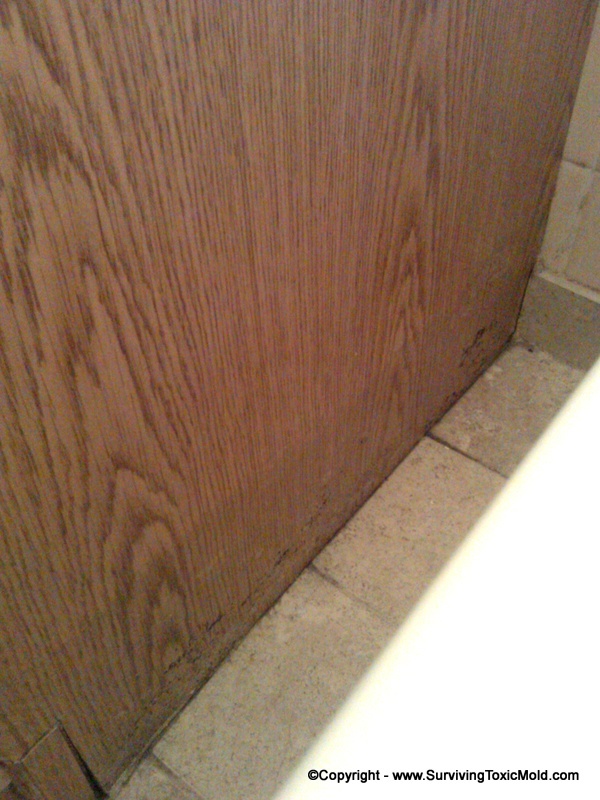 (NOTICE the mold already growing on the bottom of this particle board cabinetry). 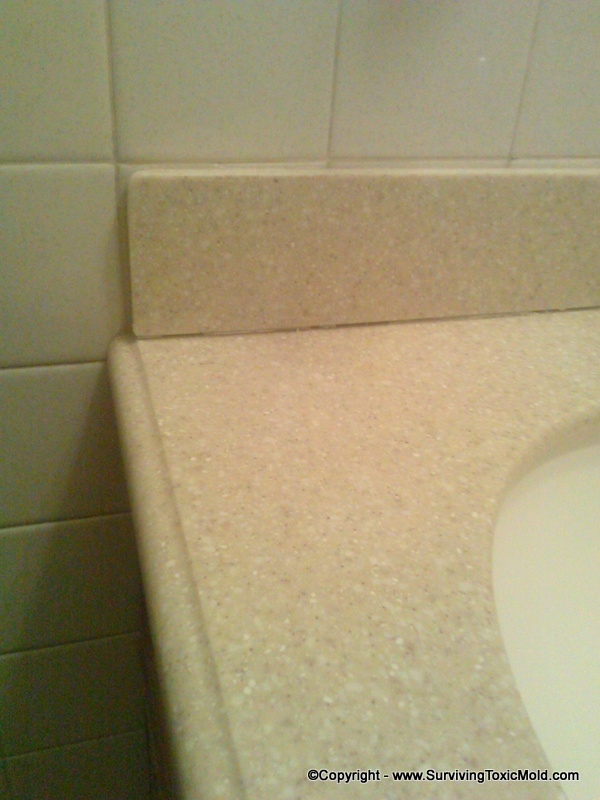 Sinks that are not properly grouted It is common for designers to now use tiles or stone as decorative features, but these can lead to disasterous consequences if they are not grouted and sealed properly. Make sure that no water can get past the grout stone/tile to reach wallboard. 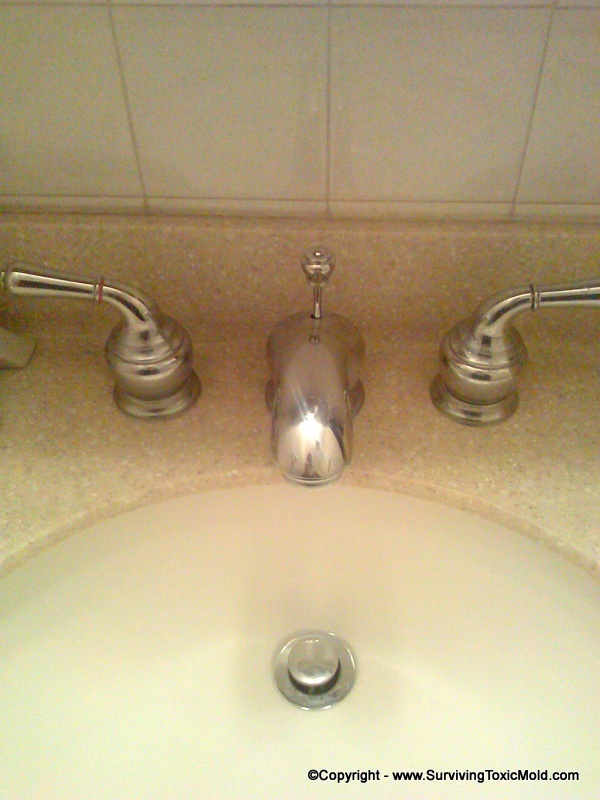 Sink knobs that are not properly tightened and sealed with waterproof sealant Over time sink knobs can loosen or cause leaks. Most of the time we see this as an annoyance and not a safety issue. This could not be farther from the truth. BEWARE...any small leak, even drops can cause deadly TOXIC MOLD to grow. Under toilets (Faulty or old rubber seals can leak into subflooring causing toxic mold). 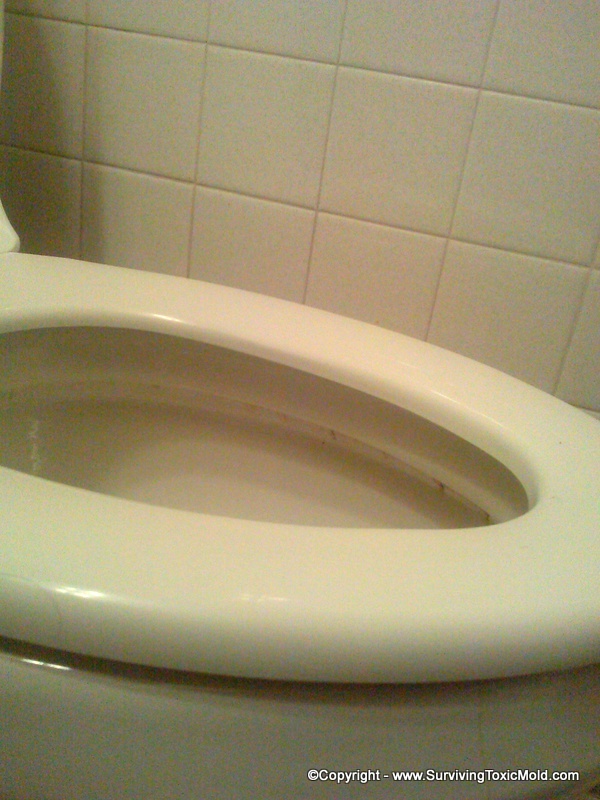 If you see ANY moisture coming from below your toilet, get it checked out IMMEDIATELY!! Toilet seals do wear over time and can cause expensive home repairs, years of illness, not to mention structural damage and mold remediation costs. If left for more than a month it could end up costing you your home and possessions. Between Shower liners and tiles Most often when bathroom shower liners are installed they are sealed to prevent mold and moisture from getting behind them. However, after you've had a shower liner installed make sure to check every few months for wear as the seals can come loose over time. To re-do seals simply use a mask and gloves, spray area with 50/50 ammonia and water and then remove seal with knife, blade or screwdriver and re-apply sealant. 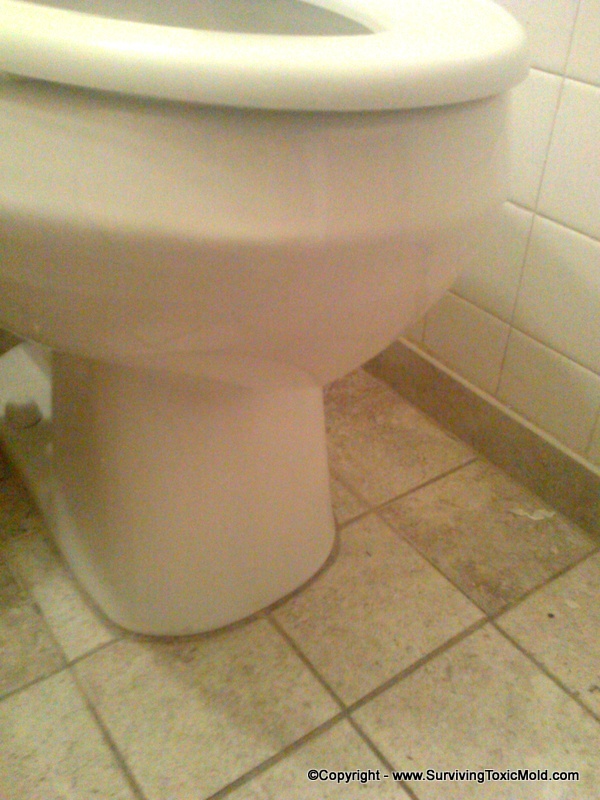 Tile Grout Grout in tile can either be 1. 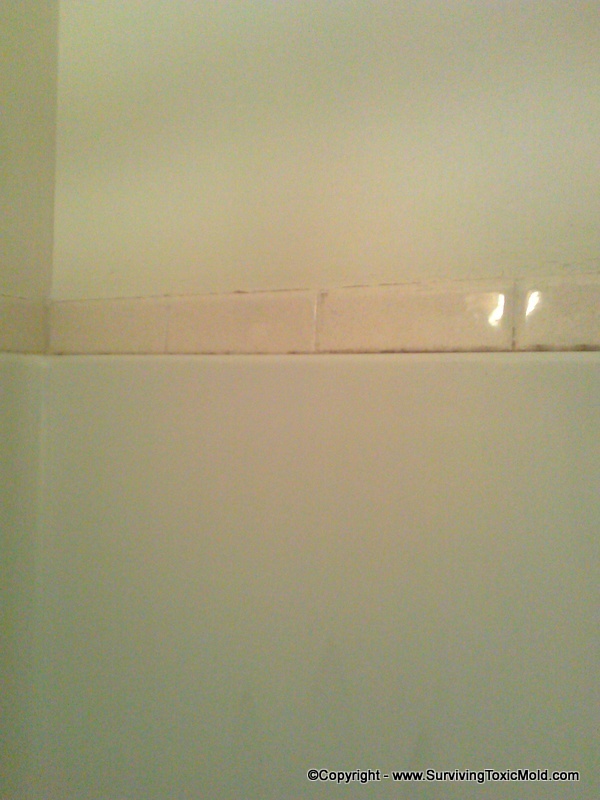 Not done right the first time by not having enough of the grout in between each tile or 2. Wear over time. It is important that every 6 months you check the condition of the grout in your home around wet areas. This could be bathrooms, laundry rooms or kitchens. 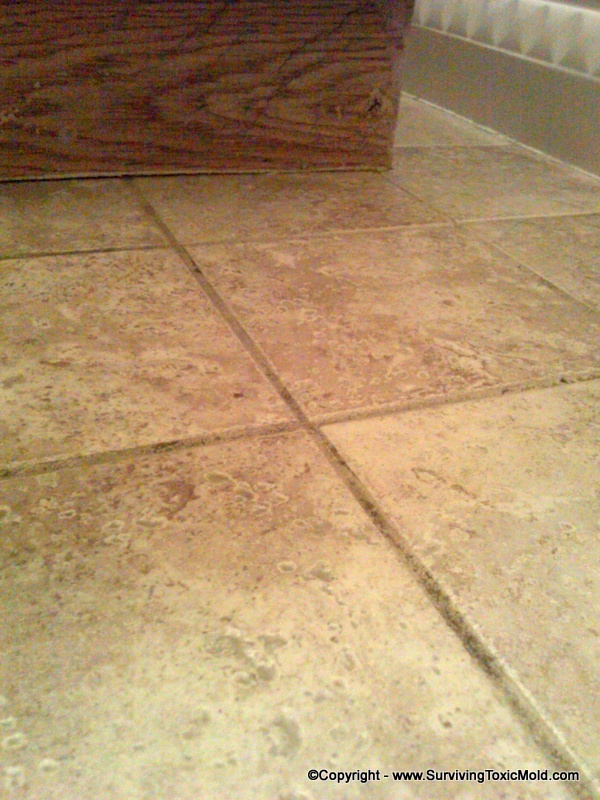 Notice the black mold growing in the grout of this tile floor. After each person stepped out of the shower this was the area that got a lot of traffic and wear. As a result of this wear, the grout became loose and water begin to penetrate the subflooring underneath. 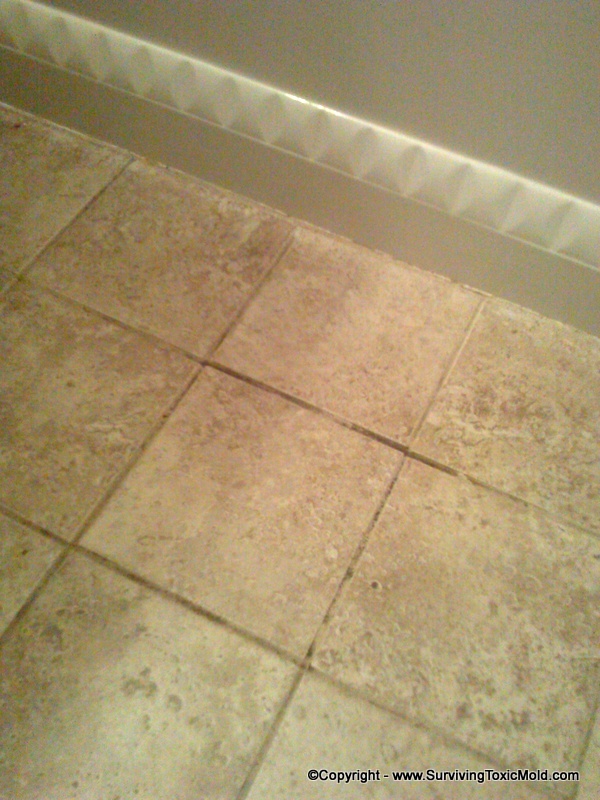 Bathroom Baseboards Baseboards can be a "not so obvious" place for toxic mold growth. Most people do not realize that when you are mopping your bathroom floor that if you mop and leave too much water it may not evaporate in time and also seep between the floor and wallboard and cause toxic mold growth. Make sure to wash floors in bathroom areas with either baking soda, borax solution or ammonia to prevent mold. Also make sure to wring out mops and do not leave any standing water after either bathing or cleaning. Window Air Conditioners Window Air Conditioners can be "death traps". They collect moisture from the outside and allow mycotoxins to be pushed into the home. Remove air conditioners in the winter months and make sure to take them apart and clean them with a solution of 50/50 ammonia and water OUTSIDE before putting them back into the windows. Failing to clean out your air conditioners each year raises your risk of mycotoxin exposure greatly!! Also this increases risk of contaminating your entire home. HVAC Drain Pans Condensation pans are under the system cooling coils. As the air passes through the coil, moisture from the air condenses and accumulates in this pan. When your HVAC system is operating properly, the pan will collect and quickly drains away all condensation. 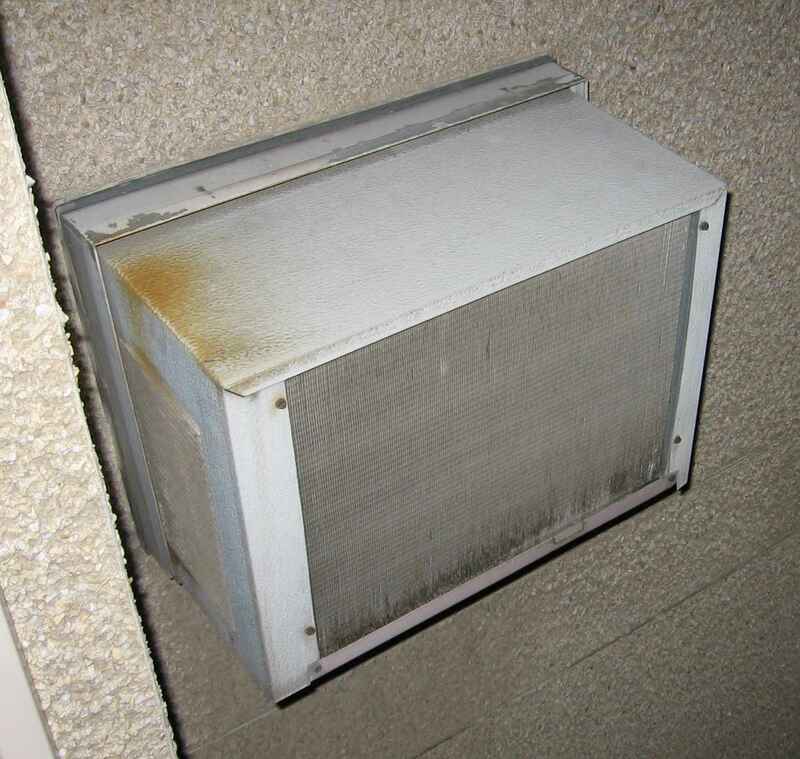 Unfortunately, your HVAC system may not always operate like it should. If the flow rate across the coil is too high, condensate can be carried downstream from the pan, soaking the ductwork and creating an environment in which mold can grow. Condensate pans can corrode through, allowing water to flood areas under the air handler. Ceiling Tiles Offices, warehouses and shopping areas are one of the most common places that mold victims complain of being exposed. Ceiling tiles are highly used in buildings, warehouses, shopping areas and office areas especially right above where employees or visitors shop, work and eat. 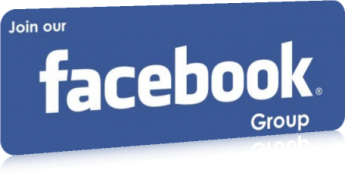 Acoustical ceiling tiles are porous and readily absorb both moisture and dirt. Of particular concern are tiles located around ceiling HVAC system vents and below roof leaks. These tiles are subjected to the highest humidity levels in the space and accumulate more moisture leading to the growth of mold.